Yesterday I had a conversation with a designer friend who was telling me about his office cleanse in which his assistant urged him to toss any magazines he hadn't read in a year. Horrified at the thought, I started flipping through my own endless collection of magazines today as some sort of subconscious justification for keeping them. 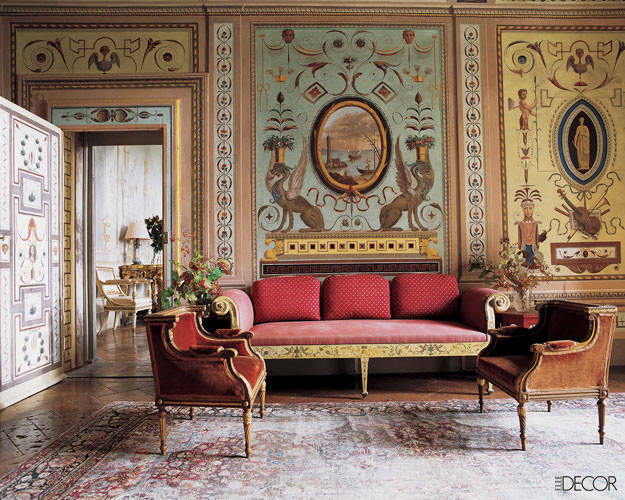 The justification continued as I came across this photo of the Tuscan estate of Leonardo Ferragamo and his wife, Maria Beatrice in the March 2009 issue of Elle Decor. This living room tells me one thing - we don't use the art of fresco near enough these days. The life that these fresco painted walls bring to the room is overwhelming. An office cleanse. We did a juice cleanse together a few months ago- but I am not sure if I could do it with my magazines. If you had any idea of the stacks we have around here. Its overwhelming. I just can't let them go. Hope that you are well! Come to SF soon! I love your new look and branding!! Everything really looks amazing!